Key West and Ernest Hemingway go way back. In the 1930s, Hemingway didn’t just have a house in Key West, he called Key West home. Whether he was officiating boxing matches at Blue Heaven or drinking with Joe Russell at Sloppy Joe’s, Hemingway had a strong presence on the island. And Conch Republicans like to keep that presence alive each July with a week-long party. Hemingway Days are an ode to the famous writer, complete with some of his favorite pastimes and memories - fishing, writing, and drinking. No matter which events you attend, you can always expect an after-party to follow. First, there’s the Papa Look-Alike Contest, hosted by Sloppy Joe’s. Each year over 100 bearded men vie for the honor of being named Hemingway’s closest resemblance. Although there are three rounds, the final competition will be held on July 23, 2016, at 6:30 p.m.
Also concerning the “Papas,” is Hemingway’s yearly birthday cake celebration, hosted by Sloppy Joes and the previous look-alike contestants. That party starts on Thursday, July 21, 2016 at 5:30 p.m.
Another Hemingway-esque event is the annual Key West Marlin Tournament. Spread out over three days, this tournament is for the serious sportsman (i.e. the grand-prize is $50K). Yet, even if fishing isn’t your forte, you can still catch the daily tournament weigh-ins at Dante’s Key West Pool Bar. Check the schedule for exact times. The Key West Marlin Tournament is also hosting a cocktail party and island-style pig roast at Dante’s on Thursday, July 21 at 6:30 p.m.
We’re especially looking forward to the Hemingway 5K Sunset Run and Paddleboard Race on Saturday, July 23, 2016. Hosted by our friends Papa’s Pilar Rum and Lazy Dog Adventures, the Sunset Run and Paddleboard Race kicks off at 6 p.m. at the Southernmost Beach with a 3-mile course through the Atlantic Ocean. Runners start at 7:30 p.m. at the Southernmost Point. You can register here. However, the most eye-catching event has to be the Running of the Bulls. 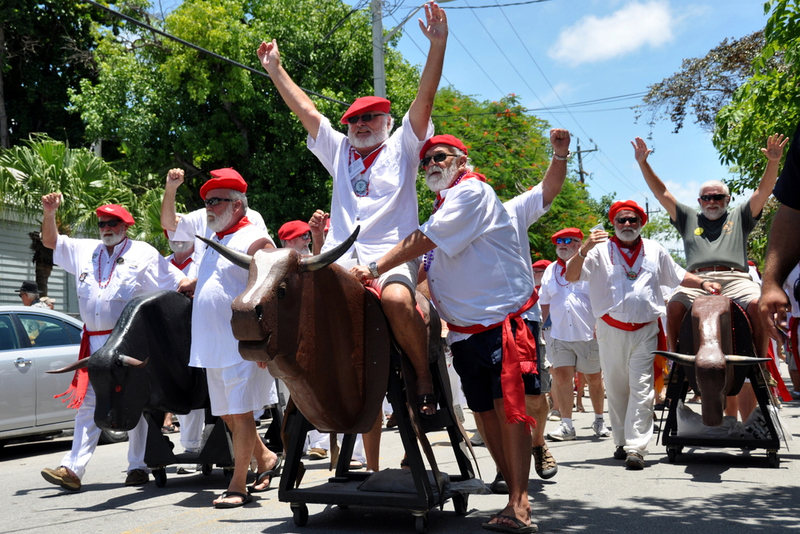 On Saturday, July 23, 2016, at 1 p.m. the Papas will parade through Old Town Key West on their own special “breed” of bulls, singing and chanting and causing a stir as a nod to Hemingway’s love of the Fiesta de San Fermín in Pamplona, Spain. Aside from the contests and parties, there are also several notable cultural events happening during Hemingway Days. The exhibition, “Depicting Hemingway,” by marine-life artist Guy Harvey will be on display at the Key West Art & Historical Society. The society will also feature scholarly presentations, while the Key West Poetry Guild will hold Hemingway poetry readings at various points throughout the festival. Consult the official schedule for times and dates. Hemingway Days 2016 runs from Tuesday, July 19 – Sunday, July 24. For a complete list of events, visit the Florida Keys website.